A two or maybe three man operation, this scene is set in a rocky ambiance with a few trees nearby. Someone is always 'busy' doing something in the bunk cabin (playing banjo, pool jaw harp, or snoring), while someone else tirelessly toils away in the mine. This is a quiet setting with plenty of critters, until punctuated by random blasting! No critter was harmed in the making of this (or any other) Scale Magic CD soundtrack. Four different random explosions. CD includes both day & nighttime scenes, this one is humorous... and a lot of fun! 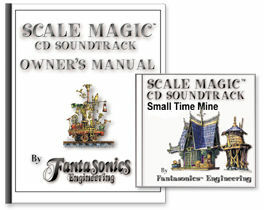 Be one of the first to own our newest Scale Magic scene release! International shipping is $9.00 for any order. Please note: add International shipping only once per order, even if you order several items, thanks! copyright © 2013, Fantasonics Engineering, all rights reserved.